Spring is in the air! Kids everywhere are ready to ditch the snowsuits for shorts and T-shirts. Welcome spring and a new way to play with lots of fun things do in April with your family. Pastel-colored clothes. Bright white bunnies. Decorative eggs filled with candy. Easter is just around the corner! Start new Easter traditions with your family this month that you can enjoy year after year. Also try crafty projects like a paper plate Easter bunny, footprint spring chick, and thumbprint bunnies. Send your loved ones handmade Easter cards that turn a simple card into a keepsake that will be cherished. Open the back door and let the kids out. The warm weather is beckoning little ones to go outside and play. Enjoy quality outdoor time with your kids with spring season activities that keep them busy rain or shine. Is the weather not cooperating at your house right now? There are plenty of other seasonal activities that will defy Mother Nature's plans to prevent you and your kids from having fun. This month, sit down with your kids and discuss the importance of inclusion. Learning about children with autism is just one way to teach your children how to be compassionate. You can also include autism awareness printables in your lesson. We all know moms get stressed out and need some "me" time. But kids can get stressed out too. Make sure they have plenty of time to de-stress with both indoor and outdoor activities that engage their minds and bodies. Talk to them frequently to check in and make sure they're really doing okay. Slow down and savor time with your family with important, yet simple, ways to make the most of your quality time. Child abuse doesn't sound like a subject you want to discuss with your children. But sometimes kids find their friends in difficult situations and they're too young to know what to do. Child Abuse Prevention Month gives you an opportunity to talk with your children about this subject in a non-scary way. You can even take steps to educate them on how they can recognize signs of child abuse in case they ever suspect their friends are in trouble and need to alert you. Grow your one-on-one time with the kids one seed at a time. 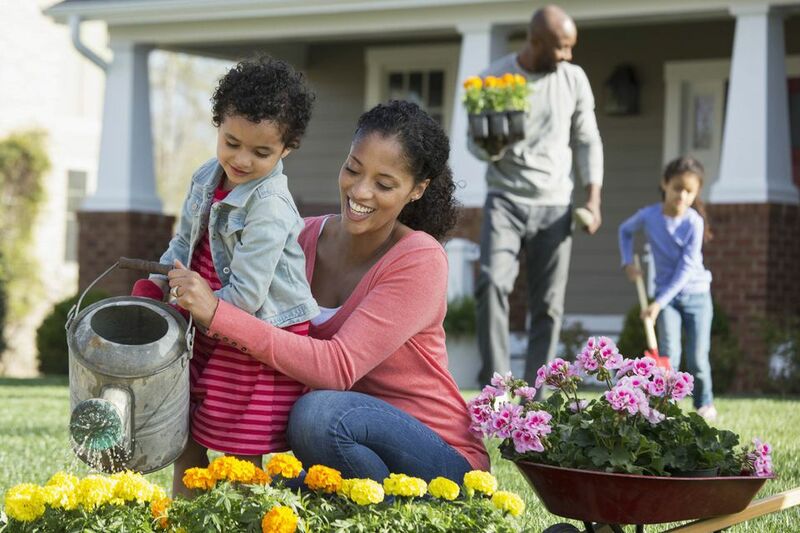 Try gardening projects for kids of all ages during National Garden Month. If your yard isn't big enough for a garden, don't worry. Kids will be just as happy planting their own garden in a bucket. We're so busy shuffling our kids off to soccer practice, running to the grocery store, or folding those piles of laundry that we often take our surroundings for granted. Introduce your children to Keep America Beautiful Month. Teach them lessons about the effects of littering, show them how to recycle, and enjoy nature activities that help them appreciate the beautiful world we live in. Organizations are in desperate need of volunteers and many are happy to have you and your children volunteer together. Raise thankful kids who appreciate their surroundings and understand the importance of lending a helping hand to others. You can also get your children involved in age-appropriate charity events to take your lesson even further. We may joke that we don't need geometry in our lives and calculus is too complicated but math is all around us. Teach kids math with fun exercises that help them love this important skill. Play learning games with math, try math puzzles and use math printables. Strike a chord during International Guitar Month. Music activities for kids introduce them to various music styles and help them develop a love of music. Whether you're raising the next B.B. King or Slash, decide if now is the right time to enroll your child in guitar lessons. For younger children, string up a shoebox guitar and let them rock on! We've all heard the cute little preschooler with his knock, knock jokes. Bring out the belly laughs this month when you teach your kids how to tell a joke. And for those comedians and comediennes in training, introduce them to everything from dinosaur jokes to ghost jokes for their own stand-up comedy performance right in your living room. You probably spend a lot of time reading to your children. This month, introduce them to poetry. Younger children can learn nursery rhymes. Older children can begin reading poetry books just for them and be learning about famous poets. Don't just read the poetry either. Help your kids write their own poetry. The life of the frog is taking center stage this month. Learn everything you didn't know about frogs, make frog crafts, or even dress like one of the green jumpers during National Frog Month. Just remember, you're doing it for the kids!